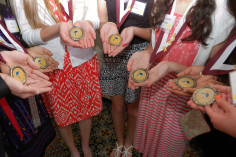 Each year a previous Carson Scholar is able to apply for recognition. Recognition inspires confidence, reassures scholars that they are doing the right thing, and helps to build leadership skills. Your donation ensures that a Recognized Carson Scholar can attend a banquet; receives a medal, pin, and trophy/nameplate; and continues on the path to future academic and career success.